Discover the scenic roads and towns from the valleys to the lakes by bike, motorcycle or car. Take in the breathtaking scenery, breathe in the fresh mountain air and watch the wildlife and farm animals as you explore our region. This scenic winding touring route follows the mighty Mitta River and allows you to take in and explore the picturesque Mitta Valley. Visit the hospitable country towns of Eskdale, Dartmouth & Mitta Mitta, all three offering ample places to eat or grab a beverage. Don’t forget to stop and take a photo at Lockharts Gap Lookout. 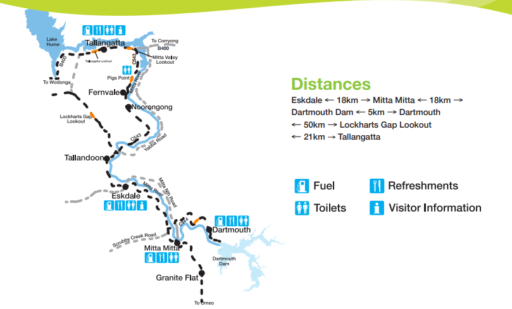 Perhaps bring your fishing line along and drop a line at Dartmouth Dam or somewhere along the Mitta River. This touring route starts in Tallangatta, the town that moved in the 1950s. 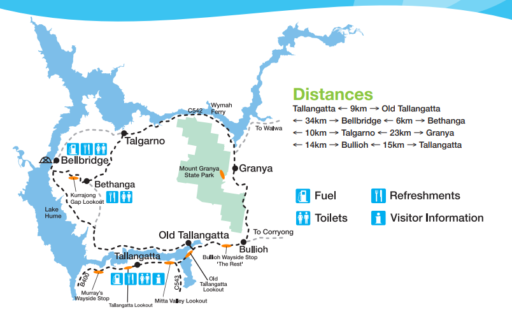 Follow the Murray Valley Highway out to the Old Tallangatta Lookout, then turn off onto Lake Road and cross the bridge to Old Tallangatta. 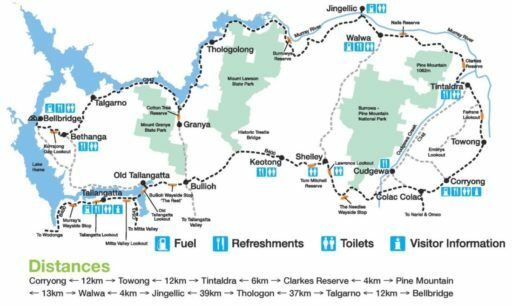 Continue along the Lake Road which is gravel for approximately 20kms and enjoy the views of Lake Hume below before arriving at the township of Bethanga. Be sure to stop at Kurrajong Gap Lookout where you can take in amazing views of Albury in the background, the Hume Dam Wall and Lake Hume. Continue onto Bellbridge and stop at the foreshore and get a photo with the large silver cod. Get a photo with the Bethanga Bridge in the background and then continue onto the Murray River Road and visit the township of Talgarno and then onto Granya, perhaps stop at the Granya Hotel to have a drink and a meal. Take in the beautiful surroundings while you make your way back to the Murray Valley Highway and the back to Tallangatta. This touring route starts in Tallangatta, the town that moved in the 1950s. The well maintained Murray Valley Highway provides opportunities to stop and explore beautiful historic trestle bridges between Bullioh and Koetong. Koetong is home to the Koetong Hotel, one of the oldest in the area and frequented by beautiful native birds. The route leads to Corryong, home of the Man from Snowy River Bush Festival and the final resting place of Jack Riley, 'The Man From Snowy River'. Locals consider the drive along the Murray River Road between Bellbridge and Corryong the inland equivalent of the Great Ocean Road, with majestic valley views of the Murray River around every bend. 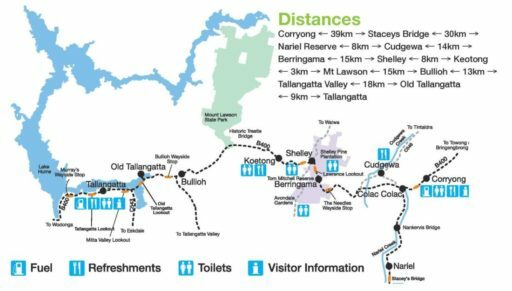 This touring route offers the opportunity for a loop from Albury-Wodonga, taking in historic and modern townships and providing opportunities to explore the valleys, lakes and vistas of the Towong Shire and the sweeping landscapes of the Upper Murray region.